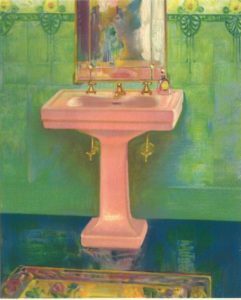 The colorful guest bathroom on the second floor of the Bellingrath Home. American prosperity during the 1920s brought a building boom, and all those new houses boasted every new amenity, especially in the bathroom. 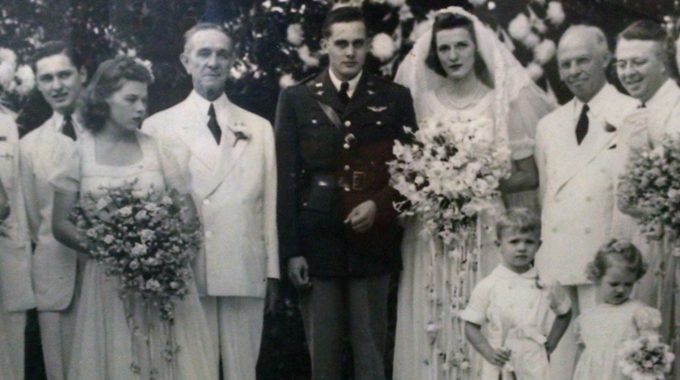 As the decade began, these rooms sported gleaming white tiled walls, floors and fixtures. As the decade ended, designers had tired of that clinical look and introduced a new idea: color. Hollywood movie stars lounging in huge tubs of bubbles in their palatial bathrooms only added to their appeal. 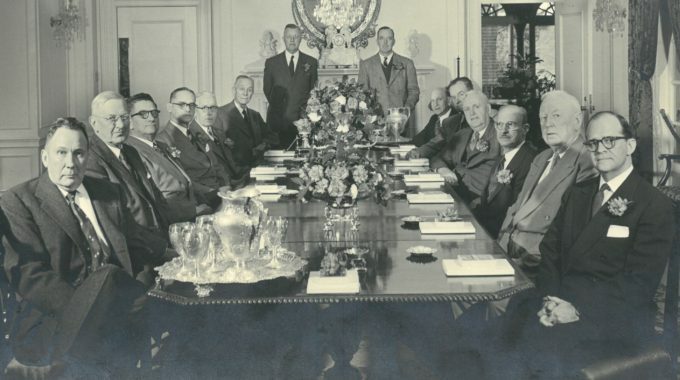 The 1929 Standard Plumbing Company catalog displayed a wide array of newly introduced colors: Claire de Lune Blue, Ming Green, T’Ang Red, Orchid of Vincennes (lavender) and Rose du Barry. 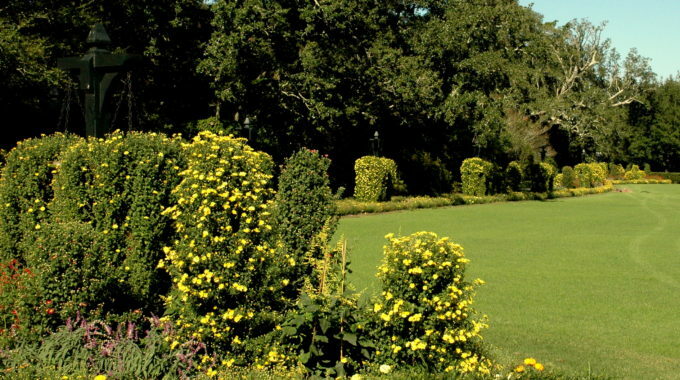 Many of these colors were used in the building of the Bellingrath Home in 1935 and delight many a surprised visitor. 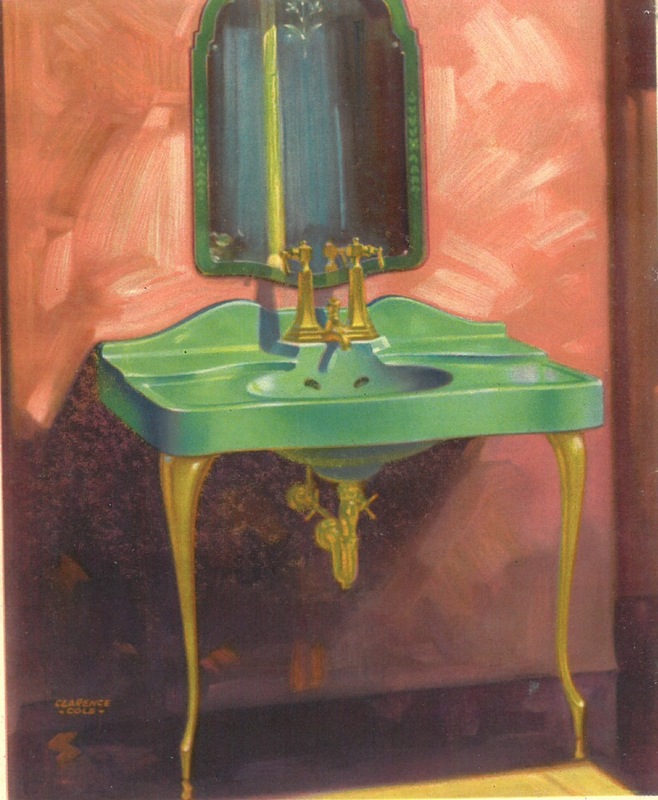 Ming Green sink from the 1929 Standard Plumbing Company catalog. 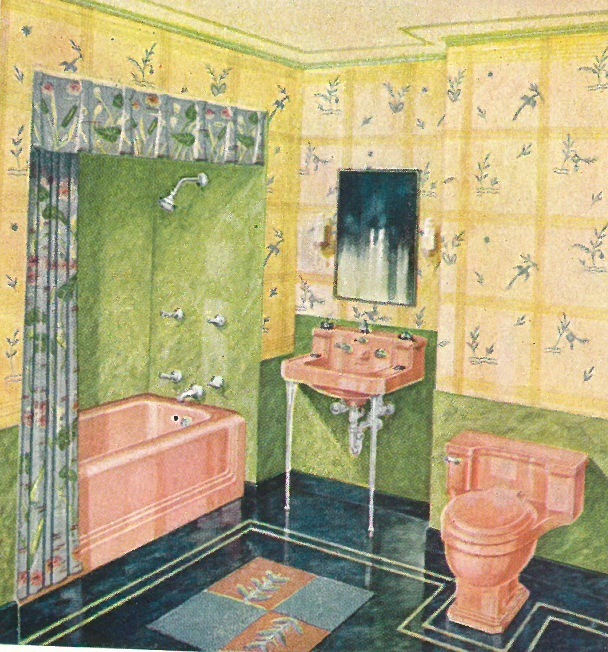 The idea of colorful bathrooms in 1935 Mobile was certainly thought to be cutting edge, and within a home as traditional as the Bellingraths’ must have startled many a first-time guest. A first-floor powder room is tiled in yellow and trimmed with blue. Standard termed those colors Ivoire de Medici and Claire de Lune Blue. 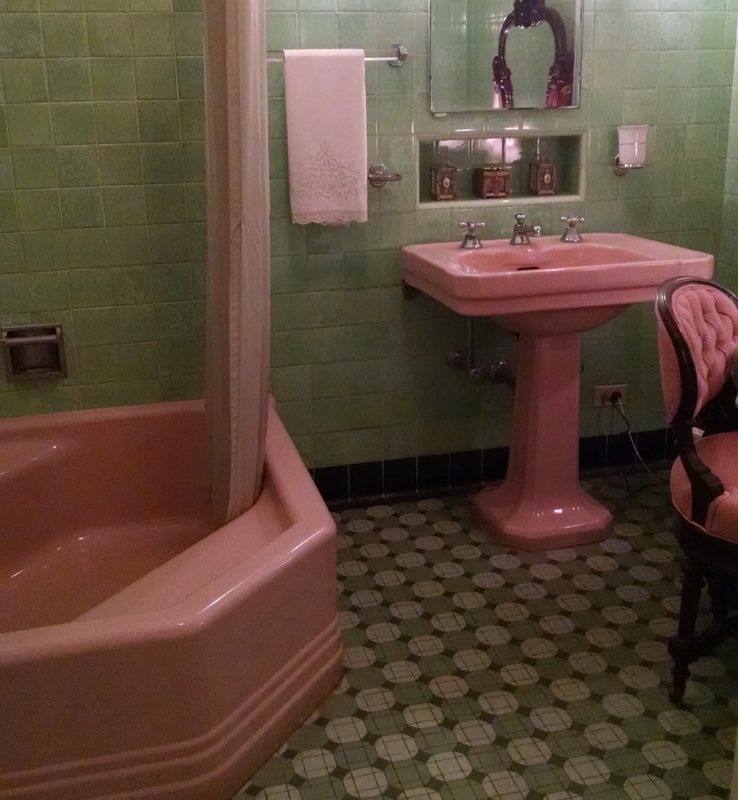 The first guest bath on the second floor glows with Ming Green tile contrasting with Rose du Barry fixtures, while Mr. Bellingrath’s bathroom is tiled in Orchid of Vincennes wall tiles and sports Ming Green fixtures. Mrs. Bellingrath’s bathroom is far more subdued and features Meissen (white) fixtures and tile trimmed with Ionian Black. According to tradition, these colorful bathrooms were the idea of Walter Bellingrath, who noticed them on display on his visit to the Chicago World ’s Fair, which was held in 1933-34 and known as “The Century of Progress.” Americans flocked in record numbers to forget their Depression-era woes and see the latest technological wonders. 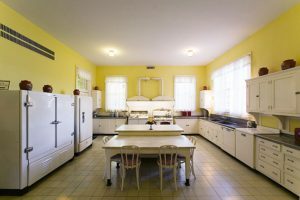 The kitchen in the Bellingrath Home was remodeled in 1941 to include a refrigerator, deep freeze, electric range and two automatic dishwashers. 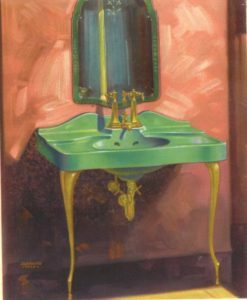 The idea of colorful bathroom fixtures became even more popular after World War II, and new colors arrived. By the early 1960s, much darker shades were introduced and would continue to be popular well into the 1970s. Today the idea of all-white bathrooms seems to have come back into popularity, but given time, the pendulum is sure to swing back once again. This page from the 1929 Standard Plumbing Company catalog shows a display very similar to the guest bathroom in the Bellingrath Home. You do such a great job. Steamboats, green grass,etc .